Curious to try Terra’s Kitchen? This unique meal subscription box comes packaged with all ingredients prepped in individual containers inside of a specially engineered returnable shipping vessel designed to reduce waste (and keep your ingredients fresh and safe on their journey). Read these reviews to see recipes we’ve tried, get cost and shipping policies, and find out how other subscribers rate this box. Looking for meal kits similar to Terra’s Kitchen? Read our list of the Best Meal Kit & Cooking Subscription Boxes! 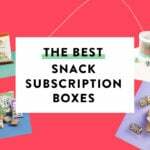 This plan is the most flexible of all meal subscription boxes! They offer 60+ meals weekly and you can select exactly which ones you want. How do subscribers rate Terra's Kitchen? Do you subscribe to Terra's Kitchen? Add your rating now!